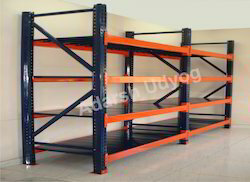 Light Duty Pallet Racks has been developed as a result of thorough study on storage and control of small and light items. With the logical design of columns, shelves and other parts, you can fabricate various types of shelf and layout according to your needs with combination of parts. There are nearly infinite applications of this rack. Maximum load capacity per shelf. They can be constituted into become a platform. Height between layers is adjustable according to goods size, Multi-purpose flexible. Looking for Light Duty Pallet Racks ?